Shaktimaan is sent to his KarmaBhoomi, which is not only a city or state or even a country but the entire mother earth. However the starting point must be somewhere so he is landed to a city. He due to his super natural powers senses a wrong thing to be happened somewhere and his first assignment was started immediately. A group of goons took control of the bank and collects the large amount of money from there. En route to escape they found that they have to face police and hence they got the master plan to escapte. They takes a boy named Appu as the hostage and try escaping. But all of a suddent Shaktimaan came to rescue the money and the boy both. 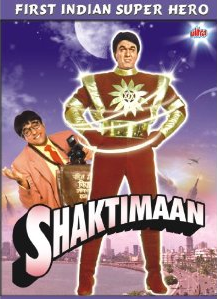 Over a series of incidents, by using his abilities and powers Shaktimaan succeeds in his duty! Appu got fascinated with this man. He thinks this is the super-hero came out of his comics books in the real world as the savior! However Shaktimaan have to stay somewhere, and he cannot live as Shaktimaan there. So he disguises himself into a layman. A rather very ordniary man from the village who is not sophisticated. He given a name to himself, Pandit Gangadhar Mayadhar Vidhyadhar Shashtri, Village: Gutinda, Post:Chikholi, District:… Well we never know!!! Remember the superman? Who lives in the disguise as Clerk Kent. In the normal life he is a reporter with spectacles. Same way Gangadhar is the alter-ego of Shaktimaan with spects, and two displaced teeth also. When he was trying to find a place to live, he visits a Dharmshala (a guest house, which usually has to be available for free to those who need to use it). There he see that the manager of the Dharmashala was a corrupt man. What was he doing and how Shaktimaan brings him on the right path, is something better to explore. Every hero needs a villain as it is said in the famous movie, but he need supporters as well. The people on the good side, we mean. Appu’s sister Geeta Vishwaas was one such person, she is a reporter in a local newspaper! Well, the hero surely have to meet her right? It means Gangadhar also will work in a newspaper, like Clerk Kent!? The names of the characters are also well thought. As alter ego of Shaktimaan have all its root in the Indian mythology; Geeta was named after the most comprehensive summary of the wisest knowledge human kind ever possessed – the holy book – Geeta (Shrimad Bhagvad Geeta) – and her surname is Vishwaas (means trust).The main antagonist (which yet have to be entered) is Tamraj (the king of dark) Kilvish. If acting is to be discussed, Mukesh Khanna, Tom Alter and Kitu Gidwani all are seasoned actor and know their part pretty well. The special effects etc. will like a little ordinary these days, but remarkable of course. The attributes of the main characters are weaved well. Overall a nice stuff which is not only for kids but elders too. Our verdict, go for it and you will not complain, as the DVD quality is quite good too!